Welcome to my "Simply 123 Allergy Free" blog! I am going to show you easy, delicious, and healthy seasonal gluten, dairy and soy free recipes many of which can be made in one dish. 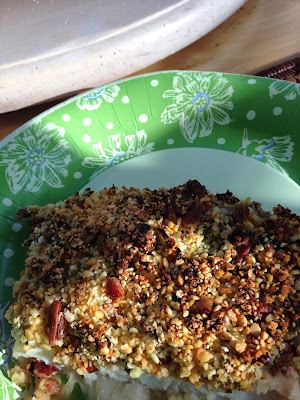 Tonight's dinner is Pecan Crusted Halibut Fillet with Healthy Sauteed Kale and Quinoa. I think you will be pleasantly surprised when you see how quick and easy this is to prepare. 1/3 cup of GF panko flakes Note: My favorite brand is "Jeff Nathan Creations All Natural Gluten Free PANKO Flakes" which are GF, Soy Free and Milk Free. 1/4 cup Earth Balance Soy Free natural buttery spread Note: This is the one in the red tub and is marked GF, Soy Free and Dairy Free. Serve with sauteed kale and quinoa for a " Simply 123 Allergy Free" meal. Bon Appetite!